I suppose that’s one way to end the Iran nuclear threat, but it seems odd that Iran would do the inviting to nuke the sites. About a year after I took over as AP correspondent in charge of the bureau in São Paulo, Brazil, the U.S. Consulate there got a new press officer, Gene Harter. I don’t recall the circumstances of our first meeting, but I do remember that there was an instant affinity. Unlike most of the guys who turned up in such jobs, Gene was a veteran newspaperman. He knew the business inside out, and although he had never worked as a foreign correspondent his background gave him a good understanding of what we were doing. More importantly his background endeared him to Brazilian newspapermen, particularly those in smaller cities who were struggling to adapt to more modern technology. Gene was a big help to them because he had also sold presses for Harris-Intertype in the early 1960s and understood the technology. I remember well the first time I met Dorothy, Gene’s wife, and their four children. It was at a dinner party at their home and that was, as Bogart told Raines at the end of Casablanca, the beginning of a beautiful friendship, one that lasted despite distance and time. Among the guests was Claudio Abramo, controversial editor of Folha de São Paulo. Inviting Abramo was a daring, but, as I learned, not untypical move that exemplified Gene’s courage. Abramo was a thorn in the side of the military government, resisting censorship and speaking out against torture. Gene’s support, with the implied backing of the U.S. government, probably kept Abramo out of jail and at his job at Folha. An even more memorable moment for me came a few weeks later when Gene invited me to accompany him and visiting Gov. 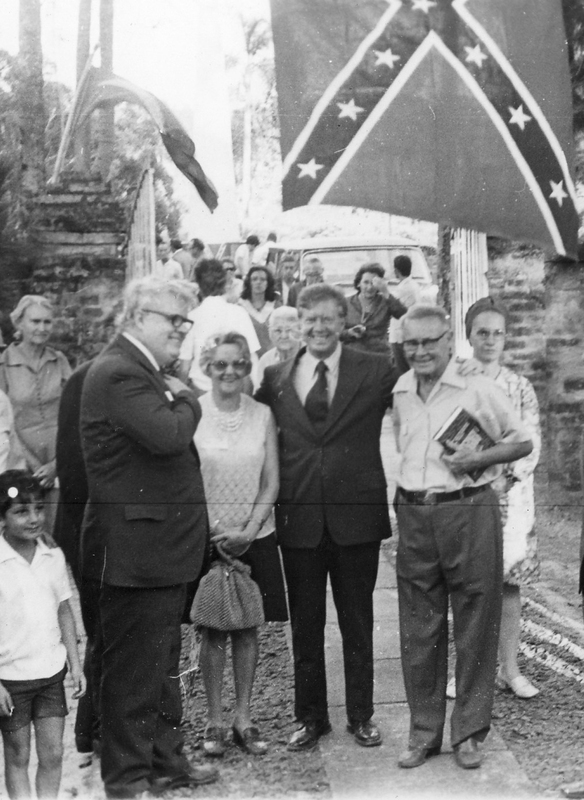 Jimmy Carter of Georgia on a trip to Americana, home of the last surviving “colony” of descendants Southern Americans who had immigrated to Brazil following the U.S. Civil War. Gene, Jody Powell, Carter’s right-hand man even then, and I rode up to the Americana suburb of Santa Barbara do Oeste where descendants of the Confederados from throughout Brazil had gathered at the little stone church and Confederate monument. I remember Powell commenting on the way there that the terrain was much like that of parts of Georgia. Carter was coming by helicopter and had planned only about 15 minutes for the stopover before going on to Campinas to visit the Purina plant there. The crowd gathered (see picture) at the monument and Carter said a few words. Then somebody asked him if he would step into the nearby church and say a prayer. I think his prayer lasted more than 15 minutes. Afterward, he and Rosalynn discovered thecemetery and spent a long time going from headstone to headstone reading the inscriptions. By the time they were ready to leave it was too dark for the helicopter to take off and a car had to be arranged to take the Carters back to São Paulo. They had missed their visit to the plant. Gene had a special interest in the American descendants. He was one of them. His mother, Maglin Harris, was born in Brazil. 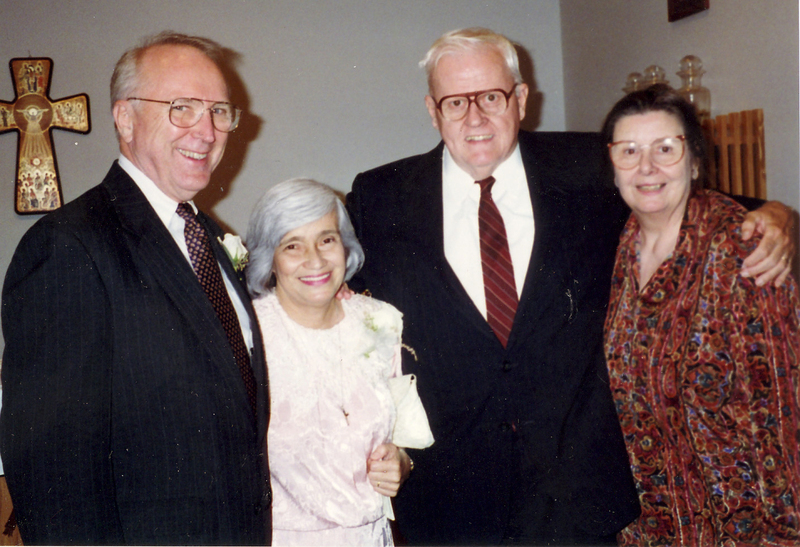 She married an American diplomat, Eugene C. Harter, and their son, also Eugene C. Harter, was born in Rio on August 11, 1926. The family moved to the States in 1936 and Gene grew up in Ohio. Gene later wrote The Lost Colony of the Confederacy about that post-Civil War migration to Brazil. A paperback version is still in print. Gene and Dorothy made several lecture tours on the book, including voyages on luxury liners. Before becoming a diplomat, Gene owned and published a weekly newspaper in Campbellsville, Kentucky, the News Journal. He ran unsuccessfully as a Democratic candidate for Congress in Kentucky before going to work for the government. Another interesting but less well-known book by Gene is Boilerplating America: The Hidden Newspaper, a history of the use of pre-printed articles distributed to small newspapers throughout the United States in the period between Civil War and the turn of the century. Gene and Dorothy were the perfect writing team. He wrote and she edited. Gene and I went our separate ways after Brazil, but we kept in touch. Our paths crossed again years later when both of us were living in the Washington, D.C., area. The Harters were living on their houseboat on the Potamac River and Gene would walk to work each day at the State Department. Later Ghislaine and I would visit them on the houseboat, which included a fireplace, in Chestertown, Maryland, after Gene retired. They lived in a beautiful old house on Main Street. When Ghislaine and I celebrated our 40th wedding anniversary, Gene and Dorothy came, driving the camper in which they were touring the country. And, by sheer coincidence, when they celebrated their 50th anniversary, the guitarist their children hired to play was our son Richard. A book could be written about Gene, and perhaps Dorothy will do just that. Friendships like this are rare and golden. We’ll miss Gene.